Dozens of football fans have been injured after a glass barrier collapsed during celebrations following a match held at a stadium in Kuwait. 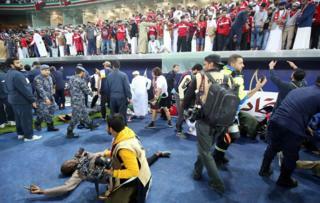 The incident occurred when Omani fans rushed to greet their team after their win in the 23rd Arabian Gulf Cup final. "The barrier went down due to pressure caused by waves of moving fans," state news agency Kuna reported. Oman beat the United Arab Emirates (UAE) 5-4 in a penalty shootout at the Jaber al-Ahmad stadium. About 40 people sustained "minor injuries" in Friday's incident, with some fans taken to hospital after being hurt while rushing to celebrate with players following their championship victory, the Kuwait FA wrote on Twitter. Kuwaiti Prime Minister Sheikh Jaber al-Mubarak al-Sabah visited injured fans in hospital, with images of his visit posted on social media by the Kuwait FA. The Kuwaiti authorities have launched an investigation into the incident.